Welcome to EMPTIES WEEK! I am so excited for these 2 empties videos/posts because I have never done one before but absolutely love the concept so I hope you all enjoy them as well. This is my skin, hair, nail and random empties but be sure to check back on Thursday for my MAKEUP products I'm chucking out! I mainly wanted to split them up because I have a lot of products to show you and wanted to go into depth with everything I've used up to give you an idea of what I thought of it. 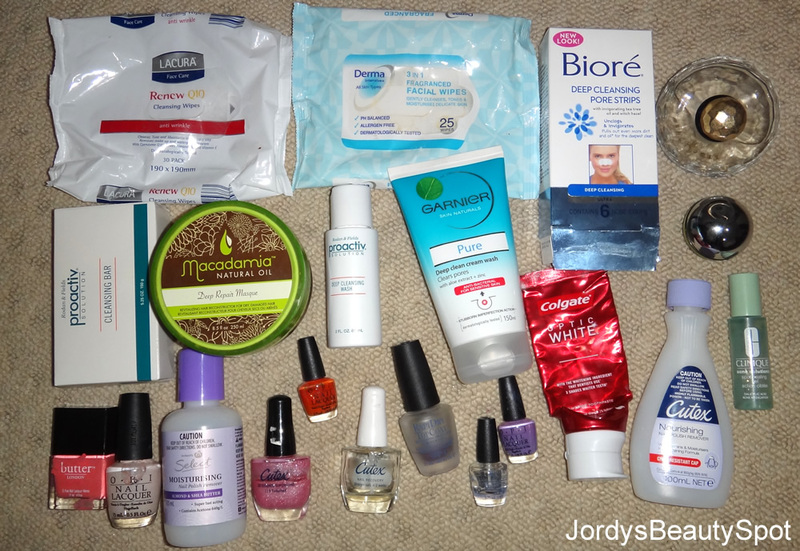 Also have a look at my video about these empties by clicking HERE. For the price, these makeup remover wipes are absolutely amazing! They are very comparable to Loreal or Dove but so much cheaper and you buy them from Aldi. I would definitely repurchase this product, in fact, I already have stocked up on a couple of packs because I don't generally go to Aldi. I don't like these ones from Coles as much as the Lacura ones from Aldi but they still did an alright job in removing my makeup. I found that the material of the cloth was quite scratchy on my skin and contained less moisture so you were left with a bit of a sticky feeling on your face. These are the first pore strips that I've tried which actually do what they claim and unclog pores while also removing black heads. This was my first pack of them but since I'm so impressed with how they worked I will definitely be repurchasing. I went through my perfume collection and although I am constantly going through it, I unfortunately managed to find that another of my perfumes had gone off. Luckily I have a 30ml version of Baby Doll so I still have the lovely scent and don't have to repurchase. I went through this little baby version of my favourite perfume of all time because it's the purse sized one. I am addicted to all of the DKNY apple perfumes but the Green Delicious is my all time favourite, I have probably gone through about 5, 100ml bottles of it and am nearly finished on my current large bottle that I have. I am chucking these two products out because Proactiv just doens't work well with my skin. I got these as samples in a beauty box and have tried to give them away a couple of times but noone seems to want them. This is a product that I have gone through many tubs off and will always continue to repurchase because it makes my hair so silky soft and amazing. I give it credit for keeping my hair so easy to work with and smooth despite how much stress I put it through with heat styling so I definitely recommend trying out this miracle product. I'm also about to finish up the macadamia oil in the squeeze pump which is really great as well. This is the face wash that I have been using for the past year or so and I've gone through many bottles so will definitely be repurchasing this again. What I love so much about it is that it's very gentle on the skin, comparable to cetaphil, but it still lathers and gives a really good clean. I really did like this toothpaste, it's does slightly brighten your teeth short term but I wouldn't say that it permanently whitens your teeth or anything. I mean, it was alright for a toothpaste but then again it was just a toothpaste so there isn't much to say. I go through nail polish like it's water because I paint my nails so often, probably 3-4 times a week. So these were both just your average nail polish removers and I'm currently about to finish up 2 more bottles. This product was great because it definitely reduced the size of redness and appearance. At 1% salicylic acid, this is quite a strong product so it did sting a bit during application. I went through my nail polish collection recently and came across a few nail polishes that had dried up and gotten old or that I'd used up so I will be getting rid of them also. Okay so those are all of the skin, hair, nail and miscellaneous empties! Don't forgot to check back Thursday for my makeup products I've used up! I hope you enjoyed this part of my empties series because I absolutely loved putting it together. I love the Macadamia oil and mask! I've been through so many of these! Great post! I love macadamia hair mask! Let's follow each other via bloglovin/fb? I love finishing products! I feel like I'm actually getting my moneys worth, especially if it took months to finish. Lovely products. Thay are just like the which Dermalogica I use. Generally I prefer less chemical products as my skin responds well to them. Thank you for your post.